You know one of the cool things about working at GAMBIT? There's all these neat people, making games for me to play. Case in point, I just heard Ahmed Wali Aqeel, one our interns from last summer, worked on a game for the iPhone called The Shady Puzzle. For only 99 cents! So of course I bought it. Anyone who's ever played Griddlers or the like will immediately get it. Wikipedia tells me this class of puzzle is called a "Nonogram". That's your vocabulary word for the day. You're welcome. A cell phone picture of a cell phone. How recursive. All in all, it's a fine little app. 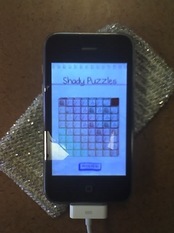 The puzzles are fun and well suited to the iPhone. There's some nice polish there in terms of page turn animations and such. I bought the game around 9:30am and had it completely finished by the time I went home at 5pm. Yes, I did do some work that day too, so I'd guess it took me about 2-3 hours to beat all the puzzles. Note I was already an expert in these puzzles before I started, so your mileage may vary. There's replay potential there as well, where it keeps track of your best time on solving a particular puzzle. It's been about three days, and I've beaten all the boards a few times now. This is what the main menu looks like when all the puzzles are beaten. I am mighty. Or neurotic. Perhaps both. A few gentle suggestions for the next version. More Puzzles! Ahmed tells me more are coming in the next release, which is scheduled for next (this?) week. Usability Improvements. While actually playing the game is fairly simple, there's some other interactions around it that could use a bit of work. It took me a while to figure out how to start a puzzle, for example, and I find the achievements page to be rather inscrutable. Clearly I achieved something, but what I don't know. Also, the guess feature is hard to use. Which is perhaps as it should be, since guessing is for WIMPS, but somehow I don't think that's what the developers were going for. Anyway, I enjoyed it. Congratulations Ahmed!